The Integrated Development Environment for zApp Developers. Currently in its early stages, it allows Developers to encrypt text-based zApp programs into binary files that any user can run. Free upgrades for two years. NOTE: This is an UPGRADE to the zApp End-user edition. 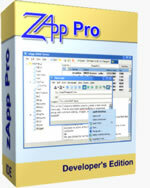 zApp End-user edition is REQUIRED to run the zApp PRO IDE.